#ThatBusinessShow – weekdays at 8am on 1250WHNZ, a show about business owners and entrepreneurs who make a difference in our communities. Please look me up on all the different social networking sites including facebook.com/thatbusinessshow and twitter at Jamie_meloni. 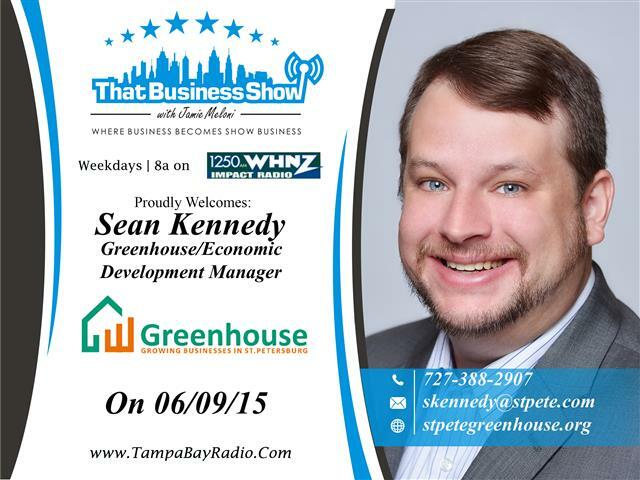 Opening up the show today was Sean Kennedy, Manager of the St. Petersburg Greenhouse. The Greenhouse is a collaborative effort between the St. Petersburg Area Chamber of Commerce and the City of St. Petersburg geared towards fostering entrepreneurship and economic development in the area. Sean and I discussed some of their many services including the Corridor Outreach and Intern Program and the Ice House Entrepreneurship Program which is launching tomorrow, 6/10/15. The Greenhouse has helped over 4000 professionals get access to the resources and support they need to both start and grow their businesses. Most of the classes and workshops are free of charge and touch on subject such as QuickBooks, writing a business plan, human resources and how to obtain financing for a business. Sean and I also touched on 1 Million Cups, a national entrepreneurial movement where business professionals can come to a meeting and pitch/present their ideas and what they are doing to other like-minded individuals to help grow and foster interest in their business. Sean was a founder of this organization and continues to help organize for 1 Million Cups in St. Petersburg each week. Held each Wednesday at 9am, interested presenters get 6 minutes free of charge to present so take advantage of this community resource to help grow your business! Learn more about the Greenhouse at http://www.stpetegreenhouse.org and you can contact Sean via email at skennedy@stpete.com for more information on their programs and ways to get involved! 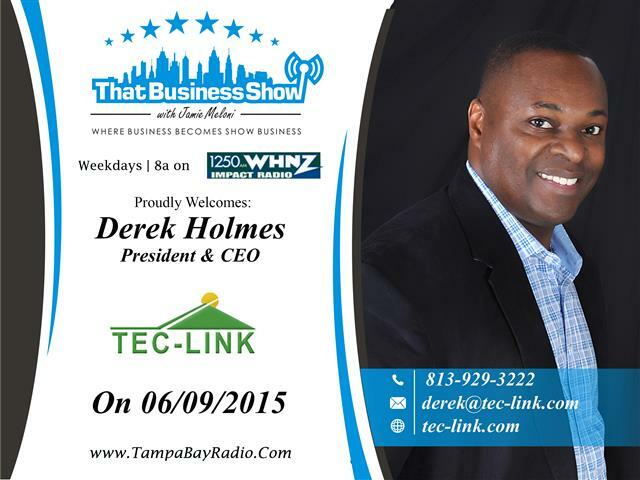 Derek Holmes, President and CEO of Tec-Link, joined me in studio for the 2nd half of the show. Derek is a Chicago native but rooting for the Tampa Bay Lighting he said in this Stanley Cup Series and we chatted about the Hockey series to open up the segment. Derek’s company which he founded in 2003, works with business owners to staff their IT departments with qualified professionals. Derek’s company has international reach and offers human resource placement in all fields of IT from Enterprise Resource Planning to Custom Application Development and much more! Derek has a lengthy background in programming and IT services going back 20 years and is very involved in the communities in which he resides in. As a former City Council member in Iowa to memberships in a number of community organizations including Tampa Bay Technology Leadership and Leadership Tampa, Derek is committed to helping foster community growth. Derek and I also touched on the need for business owners to support local men and women and troubled youth with support through jobs and mentoring and he touches on a local program call the Computers Mentors Program geared towards solving this problem. Derek and I shared a great segment together and please reach out to him for more information on getting involved in the community or to help your business with IT solutions and staffing. Learn more at http://www.tec-link.com and Derek can be reached at 813-929-3222 or Derek@tec-link.com!